Generously salt and pepper both side of chicken breasts. On a large plate, add flour evenly and coat both sides of breasts with flour, roll on to sides of breast for full coating. Add more flour as needed and set breasts aside. In a large sautee pan or cast iron skillet, heat 1 tablespoon of olive oil over medium heat. Add onions, garlic, and shallots and saute for 5-7 minutes or until onions begin to caramelize. Remove onions from pan. 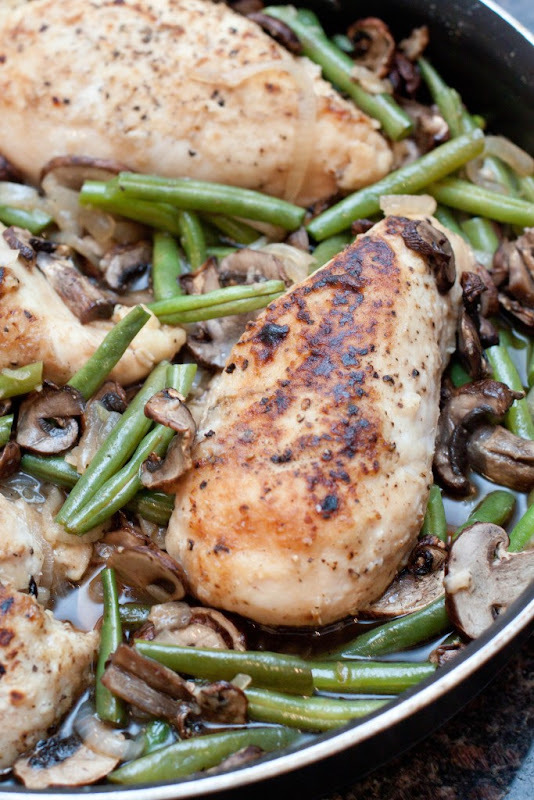 Add additional 1/2 tablespoon of oil to pan, turn heat to high, and sear chicken breasts. 3-4 minutes on each side or until they're nicely browned. Return onions to pan and add green beans and mushrooms (It will look like it's overflowing, but everything will cook down). Add beef (or chicken) stock and an additional tiny pinch of salt and a few grinds of pepper if desired (Keep in mind the salt level of your stock - low sodium stock add the extra salt). Put pan in oven. After 25 minutes, remove pan and stir veggies so that they all get coated with stock. Return to oven to finish cooking.